Steve is a man after my own heart. I have long bemoaned the fact that mobility scooter manufacturers have a duty to make their vehicles far more visible, especially for the darker months. I even gained Rotary support and funding to provide 100 high viz vests to local people. I still always carry a handful with me in the car and hand them out to unsuspecting riders. Back to Steve and his Visibags.These multi-purpose bags can be fitted to not only mobility scooters but also rollators and wheelchairs. One bag, all mobility aids. 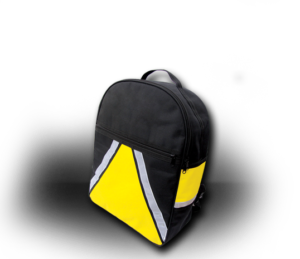 The VISIBAG has high visibility panels and wide reflective strips arranged strategically to command maximum awareness of the user in all seasons and weather conditions. The Visibag is made from heavy-duty polyester which is robust and shower proof. It has a large top opening compartment and a front flat document pouch. Each is opened by easily gripped zips. Along each side, there are sleeves designed to hold a stick/crutch holder which can be purchased separately. The standard harness fits chairs with or without headrests also wheelchairs and rollators. It has adjustable straps fitted with slide and snap fasteners. The VISIBAG is 46cm or 18in tall – 35cm or 14in wide and 15cm or 6in depth. And the best is yet to come……I think at £20 including P&P these will be definitely be making my gift list this year. Here is also a link to other useful products to help keep people safe. You can’t say I don’t try to save you time hunting, can you? THIS IS A FABULOUS IDEA, SAFETY FIRST. I AM LOOKING FOR AN AGENCY TO HELP ME DEVELOP A PRODUCT I’VE INVENTED FOR MY OWN PERSONAL USE, SINCE I AM DISABLED MYSELF. Hi Caron. What a fantastic product. £20 is a superb price. I will buy one for myself. I would love give one to a disabled friend of mine. Can I enter the draw please? John Thurston 18 Avonmore Road, London W14 8RR – Keep up the great work! You are in the hat John.